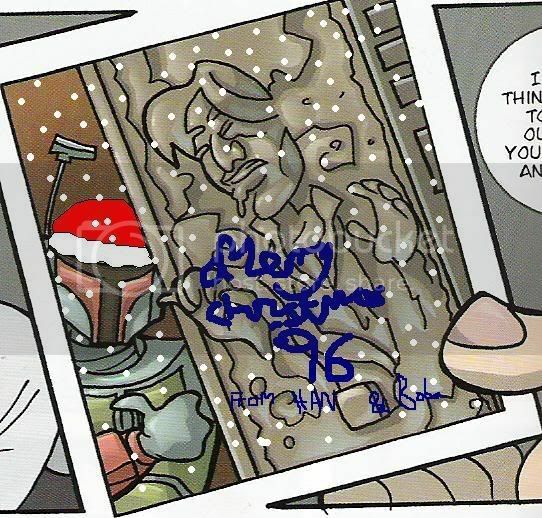 What do you think Boba would have on his Christmas Wish List? A new improved jetpack that doesn't malfunction. Yes definitely what The Cloner said. Mace Windu's head on a spike. I would've thought he would've put realistic things on his Christmas list. Well how about an AT-AT with a ship large enough to haul it and the current Slave ship that he also has so that he could have a more permanent yet mobile base. I don't really see Boba as the type to have a "wish list". He doesn't wish for things--if he wants something, he just goes out and GETS it! I'd buy him a red cape. I think he'd wish for an heir. An hour to speak with his father once last time, say the things he never had a chance to say. Perhaps a way to work things better the first time with his family. Do you have a more complete pic? I wanted to see what the person was saying. "I don't want to hang with you dorks anymore....."
Hope that answers your question....Happy New Year! totally a lightsaber-proof gun, and possibly a cortosis outer layer for his armor. Hed Just kill santa on christmas and take everthing. Haha I agree with Boba_Fett. He doesn't need to wish for anything - he could take or earn it, if he would want it that bad.